Do you have a belief that it is very difficult or next to impossible to find a new job because of your age? While there may be some truth to age bias in the marketplace, actually there are many great opportunities to explore for those over 50 who choose to think differently, who keep up with technology and who are willing to continually learn and improve themselves and their knowledge, skills and abilities. Whether searching for your next opportunity as an employee or entrepreneur, there are more choices than ever before…you just have to know how to position yourself and how to look for them. Read this excellent post Top 10 Tips article by personal finance expert, journalist and author Kerry Hannon for some very practical ideas on what to do next to help you stand out if you are looking for a job. We have spent a lot of time, dollars and frustration over time trying to figure out what we could do to help you in your quest to find a new opportunity. What we learned is that regardless of whether you are building a business or trying to find a new job or career, being involved in and effectively utilizing social media is the key to finding your next opportunity! So we decided it was important enough to suspend EVERYTHING we had on our plate and go attend the NAMS 3 three-day event in Atlanta. The presenters are numerous successful online entrepreneurs (local and international) at various stages of their online businesses and careers. They are sharing their most closely-held secrets and tips about using social media in business. It has been a jam packed weekend and there is so much information, we are on overload! Although WE invested hundreds of dollars to attend, you have an opportunity to hear some of what these successful Internet entrepreneurs said about social media marketing for a fraction of that cost. Listen to this 60 minute audio of 5 social media experts talking about their social media marketing tips, including a BONUS download link to an amazing set of over 700 webmaster video instructional video tutorials. Click here. Then, please post your comments about the material and any questions or comments you may have here. Yes, these are challenging times. But, worrying changes absolutely nothing and it can actually make you physically sick! You cannot change anything that has already happened, even one second ago, so don’t focus on the past. You DO have an opportunity to change and influence your future, starting NOW! Turn off your TV, computer, Blackberry, iPhone, iPod (whatever takes your attention away from your priorities). Start making a plan for what you want to do next and how you will implement. Then DO IT! Stop sending out massive emails and resumes to on-line job ads. That tactic doesn’t work anymore. Since approximately 85% of jobs are found through networking, your chances are less than 15% in getting a job just by posting to ads online. Start calling your contacts and getting out to meet and network with people live. Don’t call your friends to commiserate. Instead, when you do call them, set a timer for 15 to 20 minutes, max. Ask them how you may help them or call just to give encouragement. Take turns talking about positive steps that each of you can take toward fulfilling your work, career, and business goals. Make a list of how you can help hold each other accountable (in love). DO Limit your time on social media sites such as LinkedIn, Facebook and Twitter. Set a timer for 15 to 30 minutes once early during the day and once in the evening for personal scanning and posting time. Use 30 minutes to 1 hour of daily work time to search those sites for jobs or work opportunities or to promote your business and services. Be careful not to get pulled into other links and sites that can take you off focus and into “never-never land” exploration on the web! It is time to be pro-active and take massive action. FOCUS on what you CAN do and “press on” to what lies ahead. The wise person knows they cannot find new opportunity alone and that they need the help and advice of others professionally, financially and especially spiritually during a difficult time. They also know that part of their purpose is to reach out to “pay it forward” to help others in need during this time. Remember that even if the unemployment rate reaches 10%, 90% are STILL employed!!! THERE IS OPPORTUNITY OUT THERE FOR YOU! But you must be flexible, adaptable and willing to change how, where, and what you are doing to earn a living like never before. Get moving immediately to put your “Plan B” into action! Yikes! 75% of all people are unhappy with their jobs!!! The game has changed! 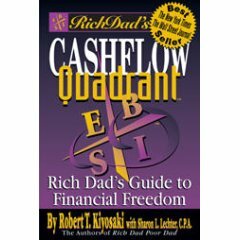 This book will change your paradigm about the difference between owning a job and owning a business and how to find financial freedom!